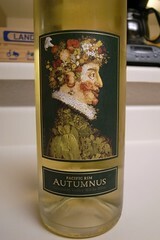 Autumnus represents everything that is beautiful about food and wine — bounty, variety and complexity. Washington State provides the ideal terroir for the varietals we've selected for our wine: Riesling, Chenin Blanc and Gewürztraminer. The vision for Autumnus was to craft a wine where each component would bring its own individuality and, at the same time, harmonically counterbalance the individuality of the other component. The Riesling brings floral aromatics and bright, fresh acidity; the Chenin Blanc lends a clean minerality and beautiful citrus characteristic; and the Gewüztraminer lends a soft, round mouthfeel with subtle flavors of passion fruit. Autumnus is crafted to pair with a diverse canvas of foods. Our white blend would be a lovely pairing with fresh, local foods such as a simple spring salad. The bright acidity of the wine would complement more rich foods like grilled fish with a cream-based sauce. While the subtle layered flavor profile of the wine would be a perfect balance to all manner of curry dishes.